connective tissue disease – disease that affects the parts of the body that connect the structures of the body together. Connective tissues are made up of collagen and elastin. Collagen is found in the tendons, ligaments, skin, cornea, cartilage, bone, and blood vessels. Elastin is a stretchy and found in ligaments and skin. When a patient has a connective tissue disease, the collagen and elastin are inflamed. The body parts they connect are harmed. 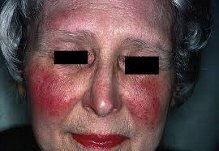 Systemic lupus erythematosus is a chronic inflammatory disease (connective tissue disease) related to abnormal work of the immune system. It is called an autoimmune condition, because patient’s immune system attacks his/her own tissues. The typical lupus patient is a woman between ages of 15 and 45 years although it can start at any age and is seen in men as well. The course of the lupus is unpredictable meaning it can be very mild or severe, even life threatening. They say lupus has one thousand faces. The exact cause of lupus is not known. The important factors are genetic predisposition and some other triggers. Some of the proposed triggers are exposure to sunlight, being ill with an infection, dust, smoking, or post-traumatic stress. The hallmark of lupus is positive ANA test (blood test). It is seen in approximately 95-98% of patients with lupus but it is not specific. People with other autoimmune conditions or healthy people may have positive test. The diagnosis of the SLE is made when person has symptoms of lupus and positive tests. Other tests related to lupus are anti-dsDNA, anti-Sm, and anti-SSA antibodies. The presence of anti-SSA and -SSB antibodies in lupus patients warrants close monitoring during pregnancy since babies of those mothers have a very small (1-3%) chance of developing so called neonatal lupus (lupus in a baby). Neonatal lupus presents with the rash and very rarely with heart beats that are not regular. Neonatal lupus is believed to be due to some of the antibodies that present in a baby’s blood for a few months after delivery. Usually the symptoms of neonatal lupus disappear in a few months. During pregnancy woman undergoes few ultrasound tests to make sure that the baby’s heart bets are regular. The immune system makes different proteins called antibodies. Antibodies are made by white blood cells. The antibodies recognize and combat bacteria and viruses in the body. When an antibody recognizes the foreign proteins of an infectious cell, it recruits other cells to fight the infection. This process is called inflammation. Sometimes these antibodies make a mistake, identifying normal proteins in our bodies as being “foreign” and dangerous. When these antibodies make incorrect calls, identifying protein as foreign, they are called autoantibodies. Autoantibodies may initiate inflammation, causing the body to attack itself. The antibodies that target “normal” proteins within the nucleus of a cell are called ANA (antinuclear antibodies). Most of us have autoantibodies, but typically in small amounts. The presence of large amount of autoantibodies or ANAs can indicate an autoimmune disease. However, a positive ANA test alone does not indicate an autoimmune disease. The positive ANA tests in healthy individuals are seen in about 3 – 15%. The production of these autoantibodies is strongly age-dependent, and increases to 10 – 37% in healthy persons over the age of 65. Even healthy people with viral infections can have a positive ANA, usually for a short time. Some medications can cause a positive ANA. Other conditions, such as celiac disease, autoimmune thyroiditis, autoimmune liver disease, Crohn’s disease, can cause a positive ANA. The arthritis in patient with lupus is usually not erosive (without destruction of the joints). Patient may have so called swan-neck or Jaccoud’s deformities. Fatigue is the most common symptom of lupus, and occasionally can be the most significant symptom. Fatigue can occur in almost everyone, even when there are no other symptoms of lupus. Fatigue may be caused by lupus itself or by underlying depression, unhealthy habits (smoking, unhealthy diet, drug abuse), stress, anemia, use of some medications, other health problems, lack of exercise, and difficulty sleeping. The Raynaud’s phenomenon causes blood vessels in the fingers and toes to narrow in response to cold temperatures, emotional stress, cigarette smoking, and/or caffeine. It causes the fingers or toes to become pale and then blue, and red. Raynaud’s is a frequent problem in patients with systemic lupus erythematosus (most people who have Raynaud’s do not have lupus although). Many people with lupus are sensitive to ultraviolet light (sunlight). It is called photosensitivity and causes the person to develop a rash after exposure to ultraviolet light from the sun or fluorescent lamps. Avoid high sun exposure, wear protective cloths and hats. Keep cotton gloves in the car and wear them while driving. Use a sunscreen with a sun-protection factor (SPF) of 30 or greater daily. Apply it 30 minutes before sun exposure. Sometimes lupus can severely damage of the kidneys and this type of lupus is called lupus nephritis. Kidney biopsy (taking a tiny piece for the evaluation in the laboratory) is often required to confirm the diagnosis and help to choose the right treatment. Glomerulonephritis or lupus nephritis (kidneys might have difficulties filtering wastes from the blood). Nephrotic syndrome (“leakage” of protein from the blood into the urine. It can cause swelling in the feet and lower legs, and other changes). Severe stomach pain, nausea, and vomiting can occur if lupus affects the pancreas (pancreatitis), the lining of the abdomen (peritonitis), or the large intestine (colitis). Pleurisy is the inflammation of the lining covering the lungs. The pain can be worse with taking a deep breath in. Fluid around the lungs is called pleural effusion. Inflammation of the air sacs of the lung (pneumonitis) or scarring of the lung tissues (interstitial lung disease) can cause problems with breathing. The most common eye symptom is dryness of the eyes with a feeling of grittiness or a lack of tearing (keratoconjunctivitis sicca). This can be treated by using artificial tears. Sometimes women with lupus have secondary antiphospholipid antibody syndrome. It can lead to recurrent miscarriages. Notify your rheumatologist about history of miscarriages when you see him/her for the first time and then in case it happens again. Lupus is considered as a chronic disease with no cure, but treatments are available to reduce symptoms and prevent complications. People with lupus are recommended to eat a well-balanced diet (low in fat; high in fruits, vegetables, and whole grains; and with a moderate amount of meat and fish). patients with active lupus and fever may require more calories. steroids increase appetite and cause weight gain. Patient may require to control appetite and stay active. with the swelling in the feet, patient may require to decrease the amount of salt in a diet. if prednisone is given to a postmenopausal woman, she should take ~1200 mg of calcium and 400-800 units of vitamin D per day to prevent bone loss. herbal and other dietary supplements are not recommended. All patient with lupus are advised to be active and exercise regularly, few times per week. Make sure to have yearly flu vaccinations. Vitamin D level should be checked and replaced if necessary. Cardiovascular risk assessment is important, especially with the chronic use of steroids. It should include assessment of the lipid levels, measurements of blood pressure and blood sugar, BMI index and if necessary life style modifications/medications use. Please, read more under “Atherosclerosis and inflammation”. Women with lupus should avoid becoming pregnant during lupus flares due to the high risk of miscarriage. The chances of having an uncomplicated pregnancy and healthy baby are improved by waiting to become pregnant until lupus has been under control for at least six months. Your physician will refer you to the obstetrician who is experienced looking after lupus patients if you become pregnant. Hydroxychloroquine medication is considered as one of the more commonly used medications in the treatment of lupus. It decreases activity of disease, prevents flare ups, prevents development of clots, beneficial in treatment of lupus nephritis, and normalizes lipids levels. Lupus is treated by a team of physicians including rheumatologist, nephrologist, respirologist, neurologist, psychiatrist or cardiologist depending on the symptoms. The choice of medication is made on a case-by-case basis. Help of the physiotherapist or occupational therapist is often required. In Ontario those services can ba arranged though the Arthritis society and are covered by the OHIP. Having chronic disease, fatigue and sometimes being off work can put a patient with lupus at risk of being depressed. Patients are encouraged to talk about depression with treating physicians since it can significantly decrease the quality of life but effective treatments are available. Even if you fell good and think that your lupus is controlled it is important to see your rheumatologist regularly. See “Useful links”, “Medical news: Connective tissue diseases” and “Medications” for more information.